For six weeks starting April 1, approximately 30 people (myself included) walked, took a series of buses (and a boat) from the northern tip of Jordan all the way to Sinai, Egypt — a total distance of 400 km. This walk marked the fifth anniversary of Spring Sessions, an arts residency and learning program that usually takes place in Amman, Jordan. 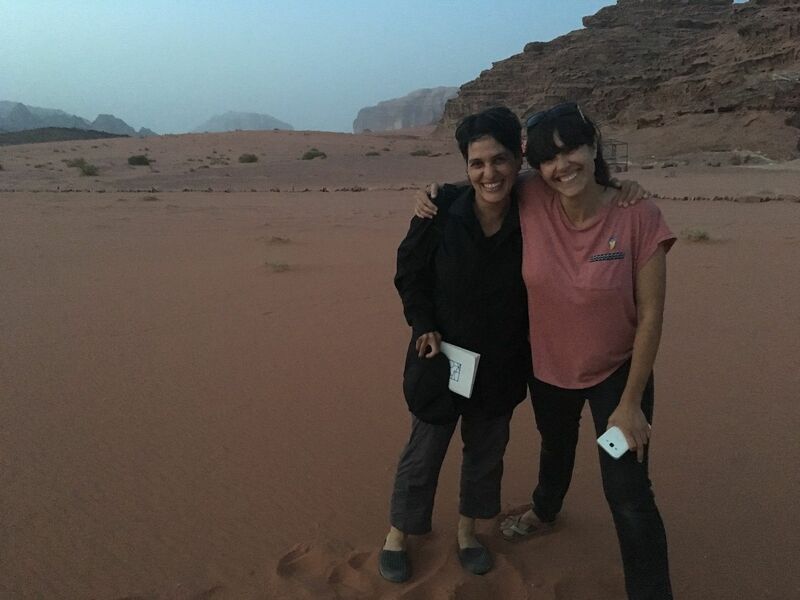 This year, as a group of international artists from various disciplines, we grazed the untroubled length of Jordan, starting in North Shuna and moving south toward Aqaba, frequently peering out across the country’s borders at the bodies of much more contested lands; Syria to the north and Israel/Palestine to the west. 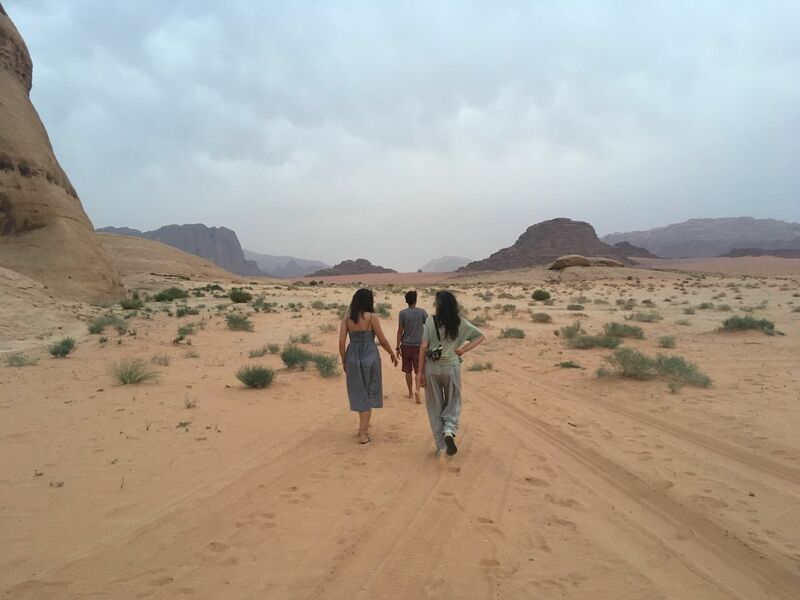 Jordanian curators Toleen Touq and Noura Al Khasawneh conceptualized Spring Sessions in 2014 as a 100-day program that creates an enclave of critical and experiential art education in Jordan. In its previous editions, the program spun out across Amman, using its streets and establishments as working venues — including the dilapidated King Ghazi Hotel in downtown Amman and Makan, a key hub for independent artists in the city. International artists and collectives, among them Raed Ibrahim, Basma Alsharif, Michael Rakowitz and the Cairo Institute of Liberal Arts and Sciences (CILAS) have organized workshops and delivered lectures to approximately 20 young and emerging artists — mostly Jordanian — each year. Other formal elements of the program have included mentoring sessions, group critiques and final presentations of participants’ work. There were early indications that Spring Sessions would push the limits of embodied art practice and pedagogy. For its 2015 edition, the design collective åbäke set up a workshop during which participants walked across Amman for 48 hours straight, collecting anecdotes and documenting chance encounters along the way, and ultimately constructing a subjective map of the city. During this year’s iteration of the program, there was no choice but to engage with the landscape as we moved through it — now for 45 days instead of 48 hours. Unlike the 2015 åbäke workshop, there was no point at which a distinct intention became universally clear — neither for what material to collect or what outcome to produce. Touq and Khasawneh did not want to burden this year’s program with structure and intentionality. They called it “wonder, wander” and left chunks of the walk unmapped. And even though we were all asked to propose collective activities that would be realised during the walk, the actual agenda — which included regular artist presentations, writing and drawing workshops, and occasional group reflections — was fluid and self-curating. On one of the walks, I forget which now, Touq told me that they had almost called this year’s edition of Spring Sessions: “walking and talking.” And just as well; we spent so much time, during our long hikes or at our temporary homes, speaking to each other — about the physical pains we were experiencing, our impressions of the landscape, love, our work, and the list wanders on. With the intention of capturing a fraction of the verbal exchange that has happened over the course of the residency, Mada Masr will be publishing three conversations that took place on the walk, of which the conversation that follows, between Asunción Molinos Gordo, Rheim Alkadhi and myself, is the first. You can read the second and third installations in the series here and here. We looked intently at Alkadhi. The wind fed on our hair; sent it sailing feistily through the air. She then passed around long, metallic needles, one for each of us, and instructed us to thread grains of sand through its eye. “Thread the needle with some loose sand to prove for ourselves the ease with which landscapes traverse the eye or are themselves traversed by the eye,” she read. Alkadhi then asked us to look through the needle’s eyes: adjust our focus; look in each other’s eyes; frame views of the desert; and gaze in at least four different directions, starting with north. In a way, the needle became a second set of eyes for us. Eyes that we held in our hands, and could barely use. 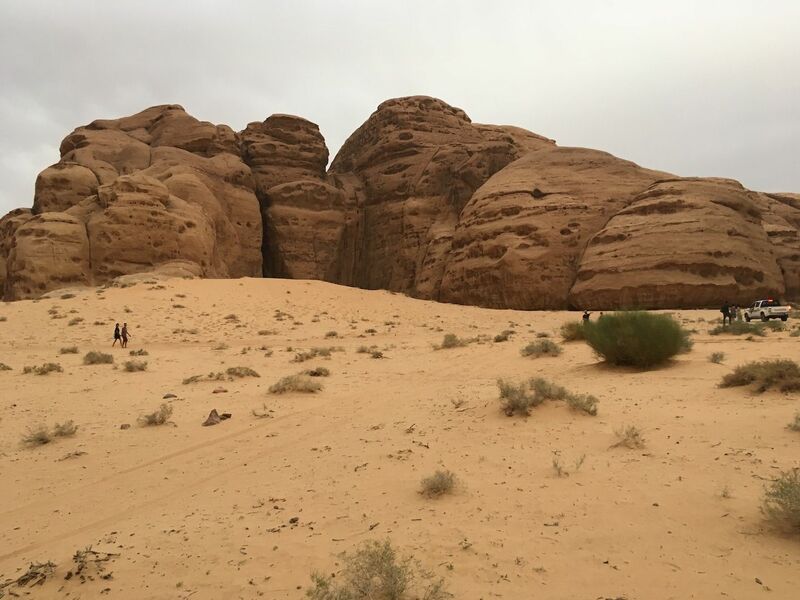 When we were done with it, the sand in Wadi Rum had been poked by more than just needles. On day 32, Spanish artist Asunción Molinos Gordo, whose practice examines the rural world and the intricacies of its cultural production, delivered a workshop, in collaboration with Spanish artist Seila Fernandez Arconada, that introduced the ancient practice of dowsing — or divining — to the group. Both artists have for years been interested in how Zahoris, or dowsers, have historically used unscientific methods to locate water, oil, and many other valuable materials underground. They gave us dowsing rods, a pair made out of tree twigs and another out of metal, and said we would use them to attempt to find ground water in Rum. As instructed, we took turns to walk slowly over the red sand, with the dowsing rods clenched close to our chests and outstretched like extra limbs, waiting for them to incline toward each other and dip, indicating the presence of water. 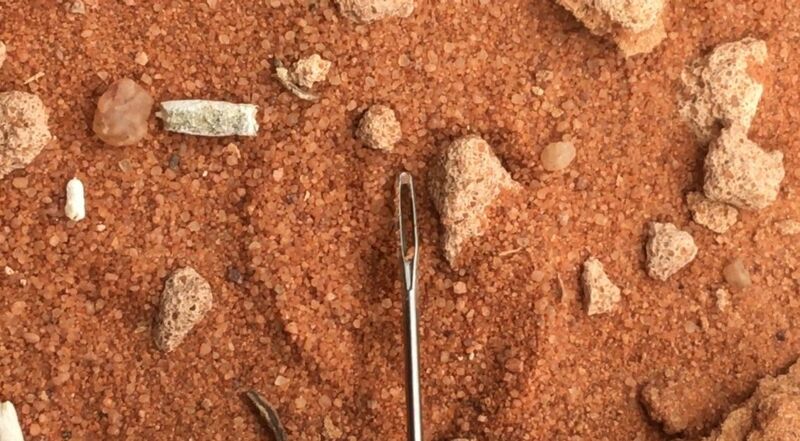 A few of us became incredibly excited as the rods gave hopeful signals, and started to dig our fingers voraciously into the earth — to no avail. Molinos’ interest in the Zahori tradition builds on her commitment to tell stories of contemporary peasantry. Her work, which manifests as installations, photography, video, among other mediums, engages with such issues as biotechnology, nomadic architecture, and farmers’ strikes. Molinos’ projects often take on an ambitious scale. Her mixed-media installation, WAM (World Agriculture Museum), for which she was awarded the Sharjah Biennial Prize in 2015, recreates the interiors of Egypt’s massive Agriculture Museum, and tackles the global food crisis and narratives of food production. In our little circle, far from the crowd, the only source of light was my purple flashlight, which I let hang around my neck. Alkadhi and Molinos had met before this year’s edition of Spring Sessions, but it was during the residency that they really got the opportunity to talk, ask each other questions, and watch each other work. When, on Molinos’ last night with Spring Sessions, I suggested that we record a conversation among the three of us, their excitement was palpable. Asunción Molinos Gordo: I am very curious to know how you got into the arts. What was the trigger? Rheim Alkadhi: Well, I think it is the only thing that I’ve ever been even halfway good at. I had the chance to go to an arts high school for two years, and that gave me the foundations of painting and sculpture and graphic design. So I got all that out of the way quite early. And even though I also studied art in college and later on, I felt like I could — and that I wanted to — experiment. I constantly wanted to see if there was anything more, beyond the structures that were given to me. AMG: And your childhood? Did it play any part? RAK: I left Iraq when I was seven, going on eight, and I think that this is an age when we are just developing our attachments and our material references. My form of play in Baghdad was so memorable, and it had to do with the construction materials in this new neighborhood that we were living in, and with the trash and the dirt. And they were all worthless materials, but they were still substantive; in terms of having had a use before and a use to come. I used them to build structures to play in, with a friend. I really want to attribute my material consciousness to that. Can I ask you the same? How did you get into art? AMG: It just happened. You know when you’re just sure you want to do something? And I remember when I was young, the only way my mother could feed me, because I was a really bad eater, was to draw things for me, like a butterfly or a fly or a rat. So I would only eat while she drew. And the thing is, I didn’t have any kind of training or visual references. Because in my village [Guzmán, Spain], the only visuals I was exposed to were the ceramics décor in my grandmother’s house, or the images I saw on TV, or posters on the street. I think the first time I walked into the Reina Sofia museum, I was 18. So unlike you, my formal training came much later. But I very much like what you said about your interaction with the materials. I don’t think I’ve met any other artist with this relationship to materials; you understand that materials are language. It’s almost as if you can read the spirit of objects. I think I pour so much intention into how art can be useful that sometimes I feel like I’ve left art out of it. I instrumentalize it; my relationship to art is as a utensil. But I lost the love. It’s become very cold, the relationship. It’s like okay, how can I get this message sent through this vehicle? But I don’t develop a loving relationship. For me, my artworks are not alive. They are not creatures that exist. They are things that I can use. You know, it’s as if I have a bag full of pots and knives, and I take them places, but I don’t look after them. RAK: What about the flute that you collected ? You’re collecting things. AMG: Ibrahim, our guide, gave me the flute he had been playing for us, as a present. He made it himself, out of a plastic tube. It’s true, I do collect things sometimes. But in a way, I’m scared of real objects, or objects that are alive, because of their greatness. Or as we say in Spanish: la grandeza. Sometimes an object can be almost divine, so I don’t know how to relate to it. But I feel like you have full trust in your objects and in the artworks you’re creating. 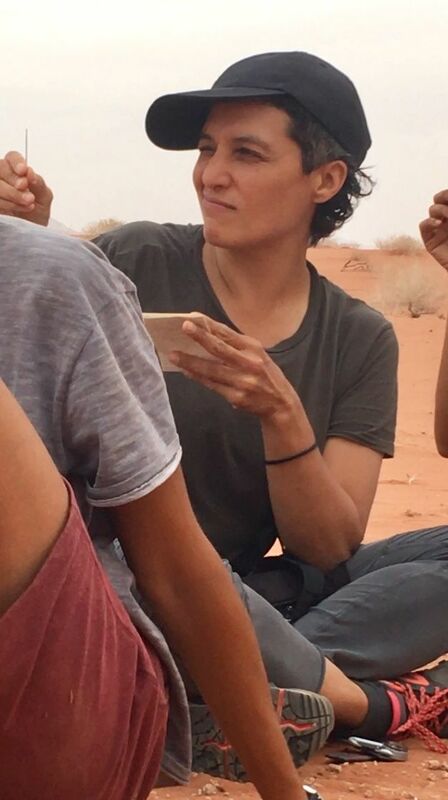 RAK: But, for example, your work of yours that I saw at the  Sharjah Biennale continues to live in different places and forms, on a massive scale. How do you explain that? AMG: I don’t know. When we go back to the question of how these things are useful or not useful, sometimes I think that when we build these big, dinosaur-sized projects, they are effective in many ways, but they are also very dependent. They’re dependent on big institutions, funding etc. They are not autonomous. So now it’s been one whole year since this work was shown. You know what I mean? It’s a needy project. But there are other forms of communication, like the ones you work with, that are super loaded. They are smaller. They can travel in time. I wanted to ask how you think your artworks negotiate space when they are being shown in an event like the Sharjah Biennale, when there are so many artworks, so many artists. Visitors don’t end up seeing all the work. In events of such huge scale, many works will definitely disappear. So how do you think your works can make a life, or do their job, in this bigger container? RAK: That’s a really good question. The other morning, you described what I was doing as “operating in the cracks of the system,” and I think that is a wonderful way to describe it, and I’ll happily do that. But maybe it’s not always so effective. AMG: I think one of the biggest challenges for artists in general is that once upon a time, there was a space for this exchange of knowledge through artifacts, objects, artworks etc. But now this space has to live with many other forms of communication and limited time and attention spans. So in a way I feel we are about to be extinct, you know what I mean? Like we are dinosaurs or some kind of crazy tribe. I don’t know, maybe it’s not so radical. RAK: Can you say more about that? AMG: I feel like our space as artists is being reduced, and that these days, there is much more mediation between art and society. Maybe in the past it was also like this. RAK: Does that work to your advantage ? AMG: No, I don’t think so. I mean, this is something that artists have been battling with for the past 100 years. The early conceptual artists said, okay, let’s destroy the museum, let’s step out of it and engage in a one-to-one conversation with the public. So in a way, we’re still in the same fight, but I think that today, the institutions are a lot more efficient at keeping the artist at bay, and in some way I feel like we are only the laborers. RAK: In a conversation we were having a couple of days ago, you described what you do as camouflage. Can you talk a bit more about that? AMG: We were talking earlier about the gap between society and artists. The visual language of contemporary art is sometimes incapable of reaching the audience. So sometimes, what I do in my projects is have them take the shape of something else so they don’t look like contemporary art, on purpose. So in previous works — like the museum, or the restaurant, or the answering machine, or the shepherd’s house that I built — unless I explain that it is contemporary art, people from a broader audience might not necessarily see it as such. RAK: I’m mostly interested in the daily — how an artist like you works day to day. Do you draw pictures for your daughter, for instance? AMG: Most of my time is taken up by research. Art only happens when it needs to take some shape. So most of my time is spent interviewing people or going to places or reading or writing or whatever. Finding information. And when one day, I come to an idea of what the project is going to look like, I go into a condensed, one-month production phase. Normally, it also happens in collaboration with other artists. So when I’m in research mode, I only do that, and when I am in production mode, I only do that. And I enjoy the production part because I don’t have to think about anything. It’s just the joy of making things. RAK: What do you look for when you’re researching ? AMG: I am just trying to find examples of cultural stories that come from the rural background. At one point, I don’t know when exactly, I learned that if there was one thing art could do, it was to make things chic. Those of us who come from the countryside, we are not chic. We are the opposite. So how can I use this dress, the dress of art that everybody is attracted to, to talk about something that nobody wants to hear about, because it comes from the past, because it’s outdated, because it’s not scientific, it’s not exciting or whatever? So I thought if I put some makeup on something that is completely disregarded, and turn it into art, maybe it could become interesting to people. It’s the whole idea of camouflage again. That is why I use art as an instrument. I really like the way you work with art because it is the opposite. I mean, I don’t know if it’s the opposite, but at least it’s more romantic. Mine is not so romantic. RAK: I think it’s pretty romantic. I think you have a way of really crystallizing intention. I’ve learned a lot from you in these past few days by these things that you say. I want to make art that is useful also. And I don’t always see the use in what I do. AMG: But how can you not see the use? Sara Elkamel: I am also curious about the objects that you have been picking up, Rheim. Quite a few people have been collecting stones, and you’ve been doing that too, right? RAK: I think this walk, with the sun and the absolute brightness and the way our eyes have adjusted to this light, makes stones pop out at certain moments. So I pick them up. And I’m now in the process of getting rid of this weighty material. Otherwise they are just immensely visual in pleasure, and I guess also in weight too. And the fact that they fit in the hand; this is really meaningful to me. But I’ve found other things that I really love, more than the rocks. There’s a plastic heel, and a part of a pair of pants that maybe somebody harvesting left on a fence, near some trees. Or that’s how I’ve imagined it. SEK: You also told me that when you’ve been writing or drawing over the past month, you’ve been making things that are really small in scale. RAK: I don’t think it’s the answer to everything, but I think that’s my tendency. I want to be able to transport it easily, and I love the idea of it fitting in my hand. It gives it the vocabulary of manual labor, and I think things that sit in our hands are powerful things, no matter who’s holding these things. SEK: I feel like both your practices move between the material and the conceptual, or the bigger-than-material, or that which is outside the material realm. And even though you have been doing material things on the walk, Rheim, like collecting and writing and sketching ideas, you came into the residency with a more conceptual approach. Maybe I’ll remind you of, and tell Asun about, your proposal. When we were maybe on the 12th or 13th day of the walk, we were walking from Taybeh Farms to Ilham’s farm, in Bayyouda. Remember that crazy walk? It was over 20 km. So we stopped at some point, and Rheim read the text that she had submitted as her Spring Sessions proposal. And one line that really struck me was this: “We graze the animals within us: across borders we do not recognize.” So I was wondering if you could maybe talk a little more about the concept that you came in with and how it’s evolved over the past month. RAK: This is the subversive quality I was thinking about. I think that the shepherds and goat herds come to a point where they don’t think about borders, and they allow the animals to just roam. In some cases, when the border isn’t so militarized, and I think between Saudi Arabia and Jordan it gets a little bit hazy or unclear where the borders are, the herders are known to let their animals graze across borders. I like that idea, and I wanted to embody that surpassing of borders or subverting of the border. SEK: Have you experienced something like that yourself while walking this past month? RAK: When I think of Jordan, I think of Iraq and I think of Saudi Arabia, and the intense conflict and violence that’s gone on there, and the violence of the border as a result. But when I wrote that proposal, I was trying to think of a way to collect all kinds of directions and awarenesses of the body and of all the geopolitics around us and of the depths and the heights. 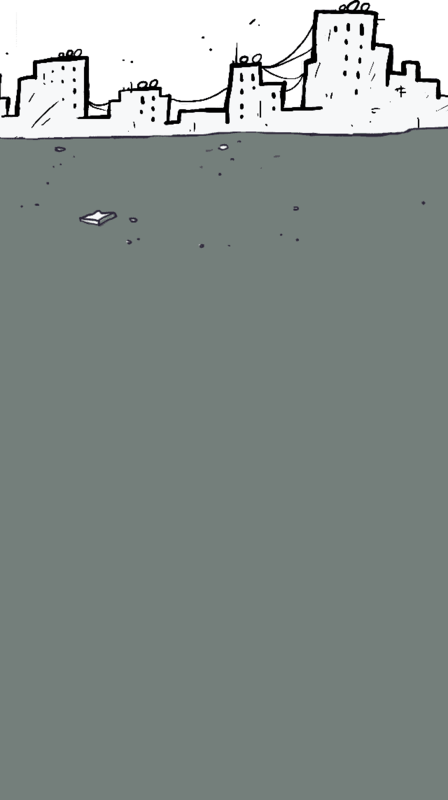 I think I wrote something in the proposal about a plane passing overhead, and the depth that we reach while dreaming, but I wanted it to be sort of an everyday practice. But I’m also really interested in the idea of the walk as a kind of curriculum. I really like this idea of experimental pedagogy. Although I’m not a teacher, I think this is the way I want to see it. Because just the word curriculum comes from the idea of a path or a course, and I thought I could somehow better understand the idea of an art curriculum by coming on this walk. SEK: Asun, your idea for a Spring Sessions project also had to do with grazing, or more accurately, overgrazing. Do you want to talk a little bit about that? AMG: It comes from the same place as Rheim’s proposal. The idea started with the knowledge that sheep and grazing animals were the first road engineers, and the ones who taught humanity how to cross a mountain, or showed us the easiest paths to take. And they didn’t get enough credit or whatever. So that was one of the ideas that I wanted to use for the walk: that the grazing animals are our guides. And this turned from an idea into a reality: all these days that we’ve been walking, we’ve been walking behind them, or alongside them. So we have been basically following the same paths that they have been following. And I was also interested in the Hema system, of how shepherds organize animals’ access to the territory. And the thing about the national frontiers is that they seem to have completely dismantled the Hema system. When we went into the Dana Biosphere Reserve, it opened up a conversation about natural reserves, and how these new ideas about the management of the territory are taking over the old ideas, and how suddenly now, the reserve authorities can tell a shepherd: Do not graze here. So again, what is the value of grazing animals? Are they still guardians of the ecosystem or ecosystem engineers? I want to prove that the goats and the grazing animals are participating in the sustainability of the reserve. So just by doing this little experiment, of collecting the manure of the goats and examining how the manure contains the seeds of the plants it eats, I will be able to show that these seeds have traveled, again from Iraq to Saudi Arabia, through grazing. So what we understand today to be the nature of this place has been constructed through the path of the grazing animals. Basically, I’m trying to shift the attention to the grazing animals as the decision makers. We are the ones who are acting accordingly. But then when it comes to credit, we get all the credit and they get nothing. The animals definitely wouldn’t have come up with ideas about frontiers. Mai Elwakil | Mai Elwakil and Jenifer Evans talk about their impressions of the 2015 Sharjah Biennial.